Two little lovebirds sittin` in a tree?.........nope, not kissin` just perchin` in our cage. Us two were given to a lady but she just didn`t have the time for us anymore. Our foster parents made a four hour round trip, zippin` down the highway, to pick us up. Luckily she made it in time. We have showed our deep appreciation to her by being very cute and adorable as lovebirds can be. We are a bit nervous when out of our cage, and will not step up yet, but while we in our cage we are little sweetie`s . We`re looking for a nice forever home with someone will spend some time with us so we aren`t so afraid outside our cage. Until then we`re just happy to have nice Mickaboo foster parents. Update: 2/8/15 - Due to circumstances Mango and Kiwi have come back to Mickaboo and are now being fostered by a new foster mom. Here is an update their adoptive mom provided with an updated picture to add to our website: Mango on the left, with a little patch of missing feathers on her wing, and Kiwi on the right. Mango`s feather loss has never resolved completely, but it`s better than when we first got her. They are a happy pair, not particularly interested in people, but they do enjoy getting out and exploring heads, hands, and hiding places on people if given the chance. They haven`t had any health issues. Mango will lay eggs every once in a while, though it`s probably been two years since it`s happened. 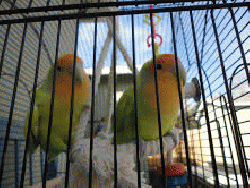 If you would like to adopt these two cuties, please let the Lovebird Coordinator know. 2/26/16 -It is with a heavy heart that we update that Mango passed away suddenly and Kiwi misses her. 3/15/16 - Kiwi has made a new friend in Peachie the lovebird.